This week we're showcasing Program Manager, Krista Odbert. Krista has been at Mortech for almost six months. 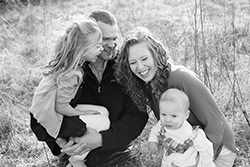 She lives in Lincoln with her husband Josh and their two children, Caleb and Kinsley. Favorite things to do on her days off: Running, kickboxing, house projects, golf, movies, pretty much anything with my husband and kids. Favorite place to travel: The beach! Favorite time of the year: The fall. Favorite thing about working at Mortech/Zillow: The commitment to Z is a team sport is an awesome part of our culture, and I see it reflected virtually every day. Everyone I work with is giving 100% all the time and that’s an awesome feeling. Favorite feature of Marksman: Prospects – I like that we provide Loan Officers the ability to track prospective clients within our system and tools to manage the relationship. Marksman Insider Tip: We are always spending a lot of time gathering feedback from clients and our internal team members on how to make Marksman even better. By clicking on the "Send Feedback" link in the top right corner of Marksman, you're able to send in ideas and concerns that we can address to maximize your overall experience.